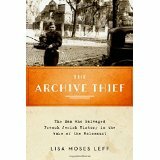 On Thursday, I attended a fascinating lecture at Drexel’s Judaic Studies department, where the guest was Lisa Moses Leff, whose new book, The Archive Thief, is about Zosa Szajkowski, who single-minded rescued Jewish books and documents from Germany and France, as an immigrant American GI paratrooper during WWII. Szajkowski brazenly used the U.S. Army free courier service to ship his parcels back– some two or three in a day— to New York, the last remaining branch of the YIVO Institute for Jewish Research. He continued to steal Jewish documents after the war and he financed his own scholarship by selling them piecemeal to Jewish institutions in the United States and Israel; the two top buyers were the Jewish Theological Seminary and the Hebrew Union College. He was eventually caught red-handed and he committed suicide in 1978. Ironically, the stolen documents have gained better care, having been catalogued and made available for scholarship. Indeed, one librarian when asked about giving back the documents, he retorted that they– the European institutions— can better pay for all the years of care and storage! Zosa Szajkowski, with his looting and his scholarship, singlehandedly established the field of Jewish historical research, using documents of ordinary Jews. So, do you think the end justifies the means? Not shy about generating controversy after she initiated the Chinese Tiger Mom storm, Amy Chua is back and she’s taking on other cultural groups. The post-World War II generations have enjoyed a life in this country that has been robust economically, militarily, and culturally in its influence around the world. As a Chinese immigrant to the United States and now a member of the Jewish faith, I’ve been an eyewitness to two cultural groups that been ascendant in their prominence. 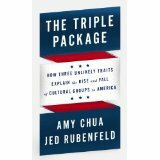 Amy Chua and Jed Rubenfeld, both professors at Yale Law School and a married couple, have written The Triple Package: How Three Unlikely Traits Explain the Rise and Fall of Cultural Groups in America. Most of the successful groups are immigrants who defy the new myth that mobility no longer exists. The authors bring their thesis to bear on how America will fare in the 21st century. The authors coined the term “The Triple Package” to cover the three traits that they posit are essential for group success: a superiority complex, insecurity, and impulse control. I am familiar with the Jewish concept of being “the Chosen People” (chosen for the challenge of a Biblically-scripted life) and the Chinese view of the world from its central place as The Middle Kingdom (better translated as Center of the World or Center of Civilization). It was fascinating to learn that all other groups that have thrived in this country, including the Mormons, Cubans, and Nigerians, have their own stories of exceptionalism. The shock of becoming an alien where no one acknowledges their heritage can focus their energy into proving themselves special and noteworthy. The second trait essential to success is a sense of insecurity. Immigrants who have been uprooted from their lands have this in spades. Fear of survival pushes them to forge new paths to success. The interesting aspect of Jewish insecurity is that this has persisted as Jews have prospered in this country. The history of persecution has a strong hold on the Jewish psyche and the impetus for acquiring an education that cannot be taken away from a person, who may have to flee to a new home. The third essential trait for success is impulse control. Asian immigrants foster a discipline for hard work, in part because they do not subscribe to the concept of being gifted. A person achieves success through diligence, not talent or high intelligence. One Chinese woman is quoted in the book speaking about watching her father and brothers starve to death in Cambodia, so that the sacrifices for a good education are easy by comparison. A chapter in the book looks at groups that do not have the Triple Package for various reasons. An interesting psychological explanation was provided by a new finding of the famous marshmallow study that Walter Mischel conducted at Stanford in the late 1960s wherein children who waited to eat a marshmallow were rewarded with a second one. In 2012, researchers expanded upon the test wherein some of the children first had an encounter showing the adults to be unreliable, such as a promise of art supplies not being realized. After this kind of encounter, the children all “failed” the marshmallow test, in that they gobbled up the first marshmallow instead of waiting for two. They were responding rationally to the fact that the adults who had promised a second treat had proven to be untrustworthy. 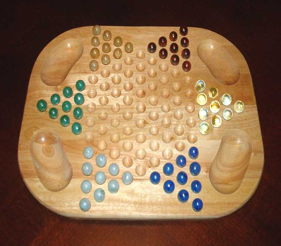 Chua and Rubenfeld wrote, “If people don’t trust the system, if they think society is lying when it tells them that discipline and hard work will be rewarded— if they don’t think that people like them can really make it— they have no incentive to engage in impulse control, sacrificing present satisfaction in hopes of future gain.” I have no prescription for counteracting parental or communal cynicism. When the authors turn to an analysis of the United States, we read about a “chosen-people narrative rivaling the Old Testament”, an insecurity fostered by the European nations, and a Puritan work ethic. (I found it interesting reading of the tension between the Declaration of Independence and the Constitution.) Zooming through time, the authors then address the contemporary ills of American society where self-esteem has become the communal goal and self-gratification our mark. Affluence has eroded our need for restraint. What remains is the notion of American exceptionalism, that we’re still the greatest nation on earth. The crux of Chua and Rubenfeld’s thesis is impulse control and this is accessible to all, regardless of family or cultural background. Even talent and inspiration need to be bolstered with much hard work. Whatever your definition of success, I find it noteworthy that the discipline acquired in one realm translates well into the rest of one’s life, whether it is through classical music training, Talmud study, or Mormons serving a religious mission in a country where one is not fluent. The authors make the case for American superiority based on tolerance, opportunity, and equality. We’re still the only nation that has a generous immigration policy. I think this welcome is returned a hundredfold with the tremendous achievements of these earnest strivers. I cannot endorse inculcating a superiority complex or an insecurity neurosis— neither do the authors– but I can heartily approve of working hard towards our goals.